Ok. Here’s the brutal truth. I’m not a huge fan of steel-cut oats. I would really just rather have my typical rolled oats for breakfast if I’m going to have oatmeal. Until . . . I found this recipe. Hello! The quinoa takes the steel-cut oats to another planet. Not even kidding! I love the extra texture and heartiness it provides. Adding the milk towards the end of the cooking time also helps to make this “hot cereal” creamy. The vanilla helps to make the end result a little richer too. I decided to add a mixture of strawberries and bananas to my breakfast bowl because I think they are a happy pair. I was delighted because my finished bowl reminded me a little of strawberries and cream, with a hint of maple. Obviously, the disadvantage to this recipe is that you can’t just throw it in the microwave and have oatmeal (or hot cereal) in 5 minutes. But, if you plan accordingly (or plan this for a weekend breakfast when you have more time), it’s worth the wait. I mean, it takes a little extra time, but very little effort. The stovetop basically does all the cooking and you just have to add a new ingredient every 10 minutes or so. Easy peasy! Seriously folks; if you’re in to hot cereals at all . . . add this to your list. It’s really good. And, if you’re wondering, I made a little extra and it re-heated beautifully for me the next day. Bonus! 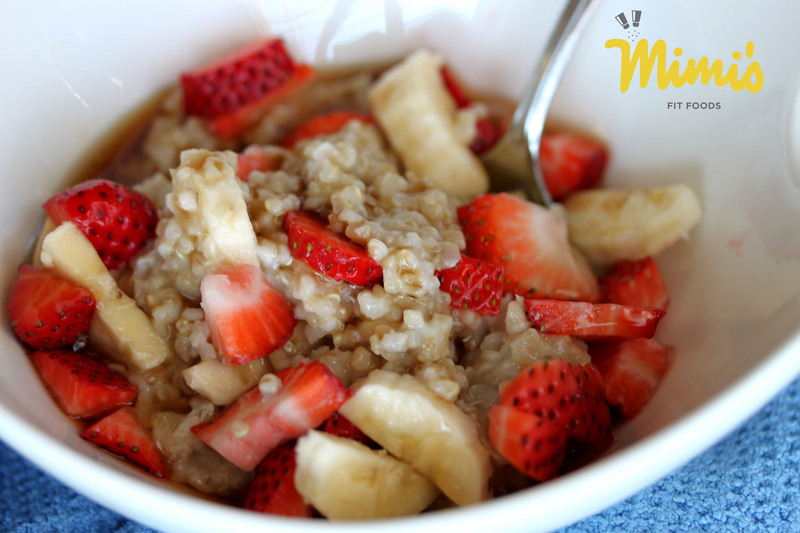 In a large saucepan, combine steel-cut oats, salt and water. Bring to a boil, then reduce heat and simmer, partially covered, for 15 minutes without stirring. Meanwhile, give the quinoa a good rinse with water in a fine-mesh sieve (rinse well as this makes a huge difference in the taste). Drain and add quinoa to the oats, give it a quick stir, then partially cover and simmer for 10 more minutes. Add 1/2 cup milk, gently stir to combine and cook for an additional 10 minutes. Remove from heat and gently stir in vanilla. Spoon into individual serving bowls and top with 1/2 tablespoon sugar-free syrup and 1/2 cup berries. This sounds so yummy! I didn’t know I needed to rinse my quinoa. Thanks for the tip – and for the new breakfast option!